During National Apprenticeship Week #NAW2018 the Apprenticeships Store Stockport held a series of events to celebrate the success of Apprenticeships and promote the benefits they bring to the people in the borough. Each day was dedicated to a different sector and a host of different training providers and employers attended to offer information and guidance on the wide range of Apprenticeships available in the different sector areas. To launch off National Apprenticeships Week at the store, we held an employer’s briefing breakfast event where we invited local employers keen to learn about the benefits of taking on apprentices and how it can help them grow as an organisation. 17 employers attended the breakfast event where they watched a presentation about why they should consider taking on an apprentice and to celebrate the success of apprentices. tion. We had the Growth Company and GP Strategies attend to offer information on those interested in business admin work. 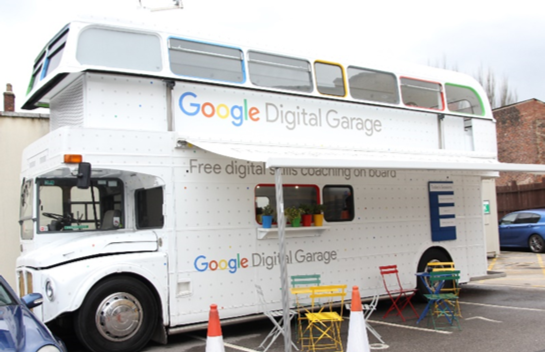 In promotion of #DigitalStockport we had our very own Google Digital Garage Bus where St Anne’s RC High School and Hazel Grove students, as well as our own SMBC staff and supported interns attended free delivery courses and advice on digital skills, how to build a cv, how to start your own business and online safety classes. 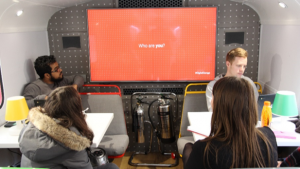 It was a popular attraction for the day which every thoroughly enjoyed.We also had a visit from the BBC and other training providers for the students to learn all about the different avenues you can explore after doing an IT/ Creative Digital Apprenticeship. The Health and Social Care day attracted many young people who got the chance to come and speak one to one with the Manchester Dental Hospital, Connect Care, Essential Learning and others to find out the different Apprenticeships within the sector and how they can open doors for future careers in the healthcare industry and children’s/young people’s workforce. The Engineering and Construction day was a soaring success. With over 30 attendees throughout the day the likes of the Growth Company, Juniper, the Fire Services, Princes Trust, CiTB and more were kept busy throughout the day offering information on all the Apprenticeships out there in the engineering and construction sector. We also hosted a Parents’ Information Evening which had an amazing turn out of over 70 people. Parents and their children came along and spoke to some of our apprentices form Stockport Council and the Apprenticeships Store staff about Apprenticeships levels, salaries, sectors etc. Feedback was glowing and the local people found the event interesting and useful. To finish off National Apprenticeship week on a high, the staff and apprentices of SMBC got together to celebrate those who had successfully completed their Apprenticeships and the new digital enterprise programme ‘iDEA’ Bronze Awards (Sponsored by the Duke of York). We also used this day to promote Higher and Degree Apprenticeships and the amazing opportunities they can unlock.